A painter of southern landscapes, Joseph Meeker was born in Newark, New Jersey and grew up in Auburn, New York. He received a scholarship to the National Academy of Design in New York City, where he studied with the Hudson River School painter Asher B. Durand and with portraitist Charles Loring Elliott. After studying in New York City, he established a studio in Buffalo, 1849-52. He then moved to Louisville, Kentucky 1852-59, before settling permanently in St. Louis, Missouri, where he painted the Louisiana Bayou. During the Civil War he fulfilled his military duties as a Union Navy paymaster on a gunboat that traveled the Mississippi River. While traveling along the Mississippi River he sketched the bayous and swamps of Louisiana. Meeker is best known for his bayou swamp scenes, but he also created landscapes of the New England coast, the Wyoming territories, Minnesota, along the Merrimac River (NH), and also created portraits and did some writing. 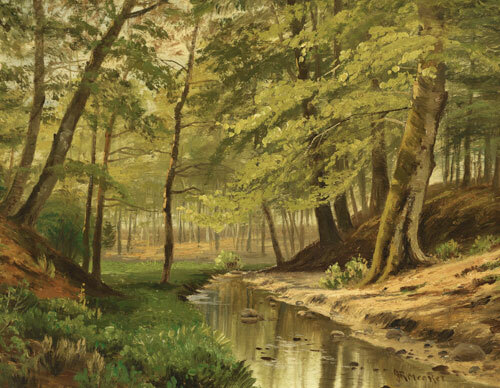 A landscape painter, William Silva was an important art world figure in Tennessee and also in California, where he moved in 1913 and for thirty-five years devoted himself to painting cypresses, eucalypti, dunes, and coasts. He was born in Savannah, Georgia, and studied at Chatham Academy and engineering at the University of Virginia. He inherited the family chinaware business, which he ran successfully for thirty years until he began painting at age 50. In 1887, he moved to Chattanooga, Tennessee, and there became known as “the finest artist at the turn of the century” (Gerdts Art Across America, V III). He painted in an impressionist style and did many panoramic views of Chattanooga as well as paintings of the pine forests near Savannah. Initially he pursued his chinaware business there, but in 1894, began to take art instruction. Encouraged by his wife, he retired from his business in 1907 and enrolled at the Academy Julian in Paris as a student of Jean Paul Laurens. 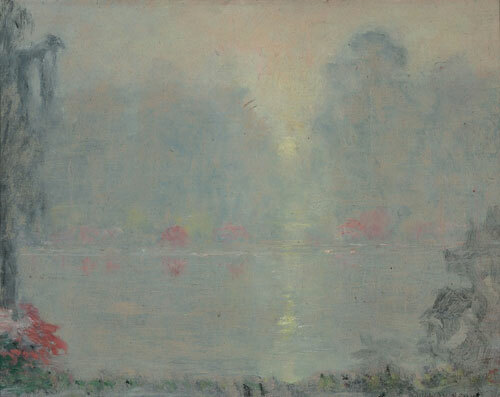 He also painted with American artist Chauncey Ryder. Recognition came quickly, and he had his first solo exhibition in 1909 in Paris at the Georges Petit Gallery. That same year he returned to Chattanooga, and a moment of great fame was the winning of the silver medal in 1910 at the Appalachian Exposition in Knoxville where he displayed seventy canvases. He then moved to Washington D.C. where he was active in the Society of Washington Artists until he moved to California in 1913. He built a studio off Carmelita Street in the sand dunes but continued to exhibit with the Southern States Art League and also maintained close ties with his birthplace, Savannah, where in 1917 a solo exhibition was held at the Telfair Academy. He was a member of numerous organizations including the California Art Club and the Salmagundi Club. He died on February 10, 1948. Meyer Straus was born in Bavaria in 1831. He emigrated from Germany to the U.S. in 1848. For a short while he lived in Ohio and in 1853 moved to St Louis, MO where he worked as a scene painter in the Old Pine Street Theater. 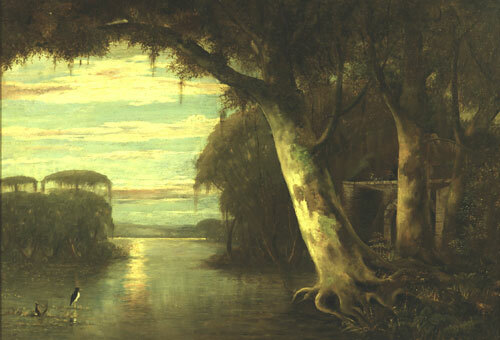 After a few years in Mobile, New Orleans, and other parts of the South, in 1872 he moved to Chicago where he painted scenery at Hooley’s Theater. Due to failing health and the severe winters, he was forced to seek a milder climate. In 1875 Straus made his final move to San Francisco where he continued painting theatrical scenery for Tom Maguire, proprietor of the Bush Street Theater, and for the Grand Opera House. In 1876 he made a painting trip to Aspen, CO. Returning to San Francisco, in 1877 he abandoned theater work to devote full time to easel painting. After establishing a studio at 728 Montgomery, he began making sketching trips to Yosemite, Marin County, the Monterey Peninsula, and Oregon. He illustrated these scenes in Century and other national magazines. In 1890 he became a U.S. citizen and by that time was supporting himself with his paintings. An accomplished and prolific oil painter, his oeuvre includes still lifes of fruit and flowers, missions, figure and interior studies, and his forte, landscapes of northern California. Straus died in San Francisco on March 11, 1905. Exh: San Francisco Art Association, 1875-1910; Mechanics’ Inst. (SF), 1875-97; Calif. State Fair, 1879-96 (medals); New Orleans Expo, 1885; Bohemian Club. In: Nevada Museum (Reno); Oakland Museum; CHS; Society of Calif. Pioneers. The Golden Era Magazine, April 1885; Bay of San Francisco.